United have added to their attacking options after signing Billy McKay on loan from Wigan Athletic. 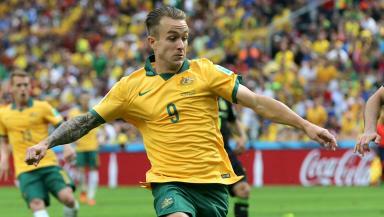 Dundee United have signed Australian striker Adam Taggart on loan from English Premier League club Fulham until January. The Tannadice side have added to their attacking options after signing Billy McKay on loan from Wigan Athletic earlier in the window and allowing Robbie Muirhead to go to Partick Thistle on loan until January. Taggart joined Fulham from Newcastle Jets in 2014 but has yet to make a first team appearance for the Cottagers. The 22-year-old scored 18 goals in 44 games for the A-League side and will join up with international team-mate Ryan McGowan in the Scottish Premiership. Taggart has seven Australia caps and three goals to his name was also part of the Australia squad at the 2014 World Cup, playing in the defeats to Netherlands and Spain.